For engineers interested in rotordynamics training, there is still time to enroll in the popular short course, Practical Rotordynamics for Real Machinery, in Sarasota, FL. The course will run from Monday through Thursday (October 22-25) and cost $2750 per participant. An optional in-depth introduction to Dyrobes will be presented on Friday, October 26, at an additional cost of $625. To learn more about the course and register, go to https://www.rotordynamicscourse.com, or contact Mark Corbo at Markatnobull@earthlink.net. 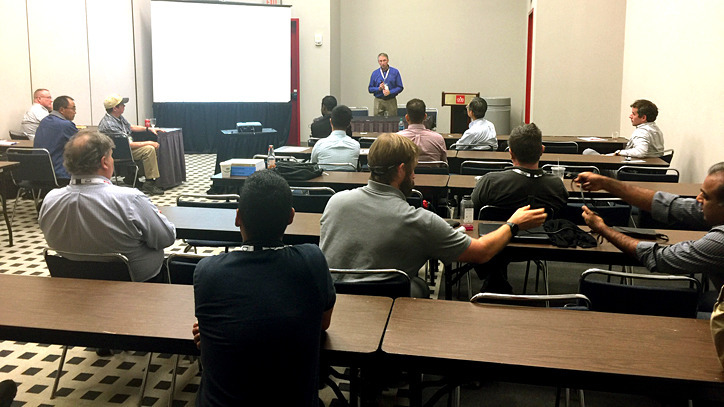 Here’s a shout out to all the engineers who stopped by the Dyrobes booth and met with the Dyrobes User Group at the 2018 Houston Turbomachinery & Pump Symposia. And special thanks to Dr. Erik Swanson and Thomas Gresham of XDot Engineering who presented Dyrobes modeling and analysis techniques, and to Dr. Wen Jeng Chen, the author of Dyrobes, who introduced upcoming features for version 21.0!